B. I. Spatial provides strategic, tactical and technical business guidance through Alteryx integration and exploitation. Quantifying spatial relationships, i.e. between customers and the stores they shop has never been easier. We can help you leverage Alteryx to gain customer and market insights you've never had before. 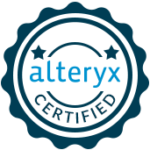 Let us show you what is available in Alteryx. Partnerships with UberRetail and the Directory of Major Malls allow us to provide mobile device-based retail trade areas for all DMM mall and shopping centers in the U.S. Additionally, we can determine trade areas for any store, yours or your competitors. Working interactively with you, we can determine the best predictive modeling solution for your specific concept. We know our tools and techniques, you know your business. Our “clear box” approach allows for your input within the model-building process, which results in optimal models, unique to your business. Our Alteryx processes make analyzing and understanding your customer’s behavior incredibly simple. We quickly identify your key customer segments, where they are and their sales potential- specific to your business. We develop analytic apps specific to your business needs and processes that are simple and intuitive to the user, but contain the proven business logic you instill. With apps built, your customers can self-serve via an internal server or on the Alteryx Gallery. As Alteryx partners, we work alongside their sales team to bring software and best practice solutions to clients across a variety of industries. We don't just sell the software, we'll jump start your success. We offer a free consultation to determine how we can help maximize your Alteryx investment. © 2019 B. I. Spatial. All Rights Reserved.